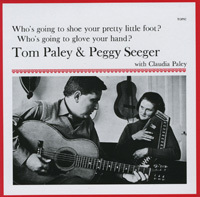 Peggy Seeger and Tom Paley, both New York, are brilliant exponents of American instrumental traditions. Guitar, banjo, autoharp and dulcimer weave a delicate majesty on a great selection of traditional material. This stunning collection, recorded in London in 1964 by Bill Leader, is a powerful example of their musical accuity and has been an influence on many younger performers. 4Â Whoâ€™s Going to Shoe your Pretty Little Foot?